Finally, the Hyde Park landscaping that you know from the Trompe Loeil Mainstore region is now available for your own builds! 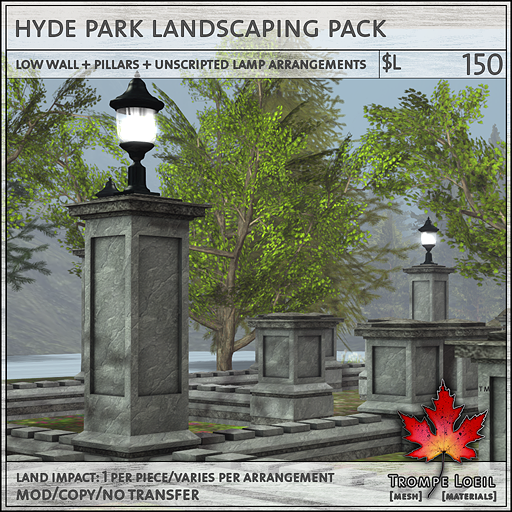 This pack includes a Tall Pillar, Short Pillar, low Wall Segment, and unscripted Lamp, plus a variety of pre-made arrangements to make your landscaping job quick and easy. Made to snap to a 0.1 grid setting, each piece is only 1 LI. Only $L150 at the Trompe Loeil Mainstore (in the Landscaping area) or on the Marketplace!